Work of the Poet: Sarah Palin Still doesn't Speak for Me! 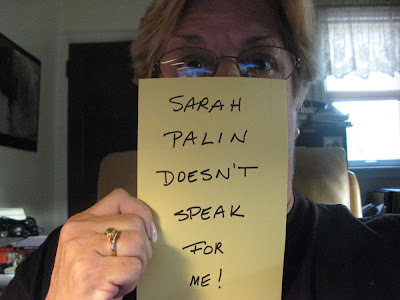 Sarah Palin Still doesn't Speak for Me! While I still state that "Sarah Palin Doesn't Speak For Me"
False Internet claims and rumors fly about McCain's running mate. She did not demand that books be banned from the Wasilla library. Some of the books on a widely circulated list were not even in print at the time. The librarian has said Palin asked a "What if?" question, but the librarian continued in her job through most of Palin's first term. Palin never endorsed or supported Pat Buchanan for president. She once wore a Buchanan button as a "courtesy" when he visited Wasilla, but shortly afterward she was appointed to co-chair of the campaign of Steve Forbes in the state. We'll be looking into other charges in an e-mail by a woman named Anne Kilkenny for a future story. For more explanation of the bullet points above, please read the Analysis. You're a woman of integrity and courage, Mary. Thanks for this. I thought it was important to post this if I posted the other post that was negative and included some of the things FactCheck.org has found to be untrue. I got a copy of that Anne Kilkenny letter. I'd be interested in seeing the "response" or "rebuttal." Thank you for posting this. I was wondering about the last point because now I was pretty sure this was the truth but I'd heard rumors the other way. I'm still for Obama but there are some issues I like McCain on. Signing statements, for one. I wish Obama would come out against them. Nobody else seems to care, except me, and I guess it isn't a deal breaker. Good post - she speaks not for me, too! I'm glad we have FactCheck and Snopes. I wish more people would check the facts. The least we can do is to vote as a well-informed constituency. Rational, fair, balanced, proportional. You are a fine person. England is the only European country with english as mothertongue. Just have a look of what is the opinion abroad. I'm going to go do a little bloghopping today in case we are given evacuation notice over the weekend. I have a Thursday blog scheduled to post tonight at 5PM, and I have a special gift for you then. You guys are great! You appreciate the truth and so do I! There are so many rumors floating around, it's good to get at the truth if you can! Anni, I'll be there on tonight at 5 PM! Thanks ahead of time. And Gattina from across the pond, thanks for taking an interest! I think the attacks on her and her family will produce favorable election results in November, smile. I am pleased to see you have the character to do this post. Even before this post I admired and respected you Mary. Now even more so! there's enough truth anout Palin to make her dangerous and unfit - I wish people would just spread that rather than all the crap. It just diminishes the message and makes it all suspect, even the factsz. i think i have fallen in love with palin...most is attraction and not facts, is it possible mccain picked her so men like me would fall in love with her and make him more popular?????????????? She doesn’t speak for ME either … and I can’t help but wonder at the ‘hype’ being promulgated in the ‘news’ … Polls are such strange things & it seems that ‘sound bytes’ have replaced ‘discourse’ in our world. It often worries me until I remember I’ve given up ‘worry’ period. Thanks for sharing this info and the link too. I do applaud the fact that, while you may not agree with a political position, you do support the truth. Thank you for clearing the air, at least your reader can depend on you to be as honest and fair as you know how to be. Good post. I had checked out the book banning thing and a number of others but did fall prey to the membership in the cessionist group. Oops. Beyond the fact that I disagree with pretty much everything Palin and McCain are for, I am deeply troubled that they are both so comfortable telling out and out lies. Too much of that already for the past 8 years. I drove to the rinks from 5 am to midnight. I became upset at referees doing the best they could. I also drove to soccer and lacrosse. Players slept at my house from not only other towns but also other countries. I've bought and sold on eBay. I"m a pretty good cook, cared for a premature son and maintain an enviable relationship with him 28 years later. I was an elected official for 11 years and continue to serve on various committees. I've also served as president of a 3,000-member local association with a $3 million budget and continue to serve. I chaired two significant committees for school district planning efforts, worked for the local party committee, and have run my own business for more than 25 years negotiating thousands of contracts. I have a degree in political science from Hobart and have taken many postgraduate courses and seminars. I am trying to teach myself Arabic. I am not qualified to be vice president of the United States.